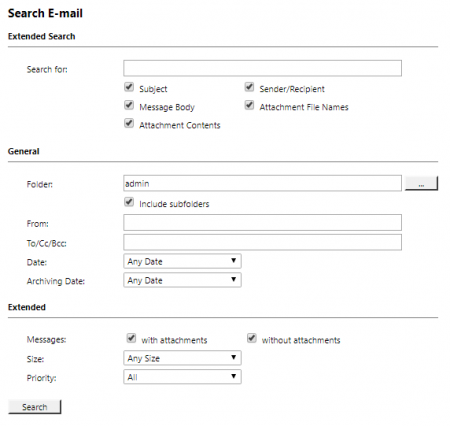 How to do intelligent searching in Cloud MailStore? would locate Andre and André. return all emails from ZDNET which have MailStore somewhere in their message body. return all emails from billing@example.com which have bill in any attachment. return all emails to recruiting@example.com which do not have sales in any part of the email. return all message from billing@example.com to myaddress@company.tld which have bill in any attachment but do not have admonition in the subject. Words inside indexed emails or attachments which are a combination of alphanumeric and non-alphanumeric characters (white space, line break, delimiter or other control characters), may be returned in search results when searching for the alphanumerical part only. For instance, when searching for test, 1234 and test_1234, e-mails containing the word test_1234 will be returned.